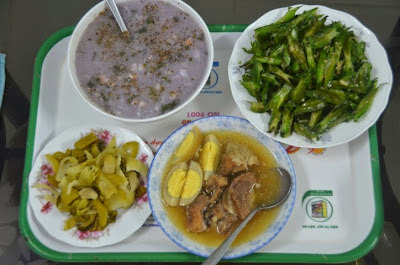 Vietnamese purple yam or khoai mỡ has a consistency of okra. 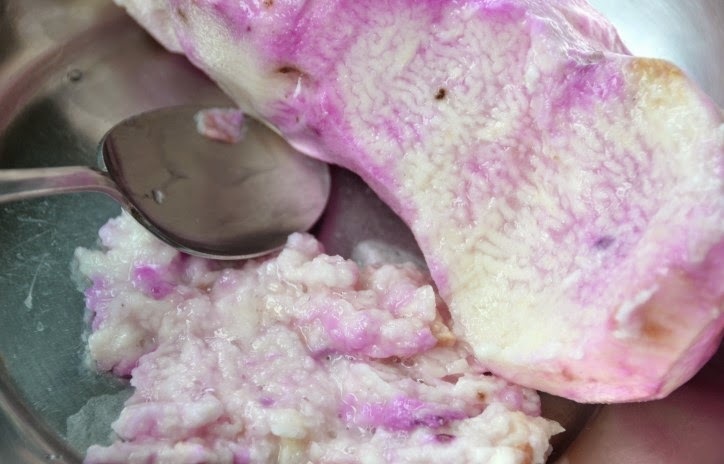 Some people may not like the slime-like slippery texture of this root vegetable. If you are not a fan of okra then you probably may not get too excited about this soup. In Vietnamese "khoai" refers to a root vegetable such as yam or potato. "mỡ" means fat. My cousin Sieu Ken made this soup when I visited her in Soctrang but she used a another root vegetable that is similar called khoai thôm ("thôm" means nice fragrance) to make this soup. My mother used to make this soup for us but not as often nowadays since these are hard to find in the United States. Prior to cooking you need to peel away the dark skin, then take the edge of a spoon and scrap down the sides of the yam for the meat. You may also use a grater to shred it. However, using the spoon is an old fashion method and it works very well. I prefer this method since it gives the soup an uneven and a much more interesting look with the small and large pieces of yam bits. I made this soup with less salt. However, if you like it saltier then add more fish sauce or salt. 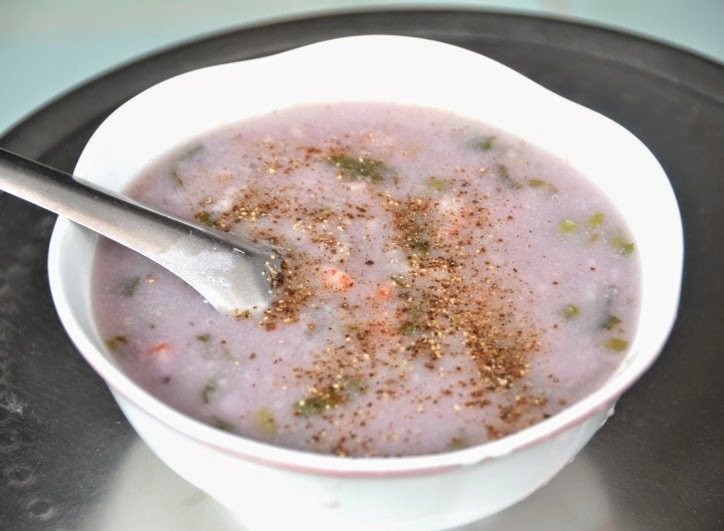 This soup is called canh or súp khoai mỡ. "Canh" or "súp" are terms for broth or soup in Vietnamese. 1) Heat a large pot over medium high heat. 2) Once the pot is hot, add oil. Once the oil is heated add garlic, scallions, pork, and shrimp. Saute about 2 minutes. 3) Add yam and saute about a minute. 4) Add water. Bring the liquid to just a boil then turn heat down to a simmer. Remove and discard any white foam or scum that floats to the top of the pot. 5) After 20 minutes of simmering (or until the yam is cooked and soft) add chicken stock powder, sugar, salt and fish sauce to your taste. 6) Turn off heat and add cilantro. 7) May add black pepper right before serving. 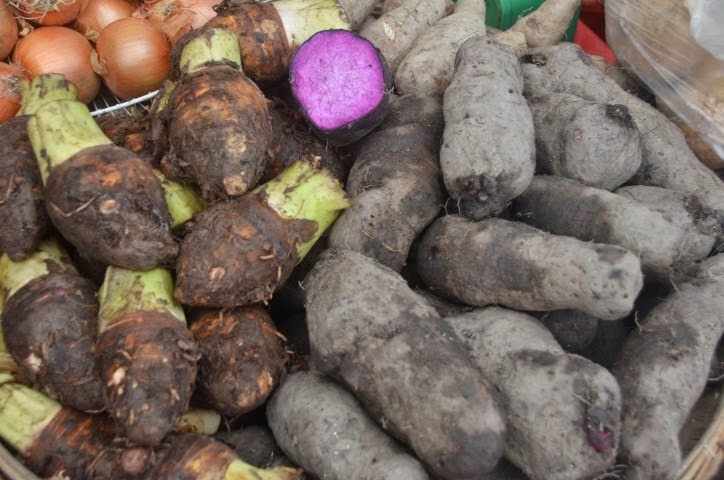 *Be extra careful with peeling Vietnamese purple yam as it is very slippery. *You may add less water such as 6 cups for a thicker consistency. *You may add more ingredients such as shrimp and pork if you prefer. 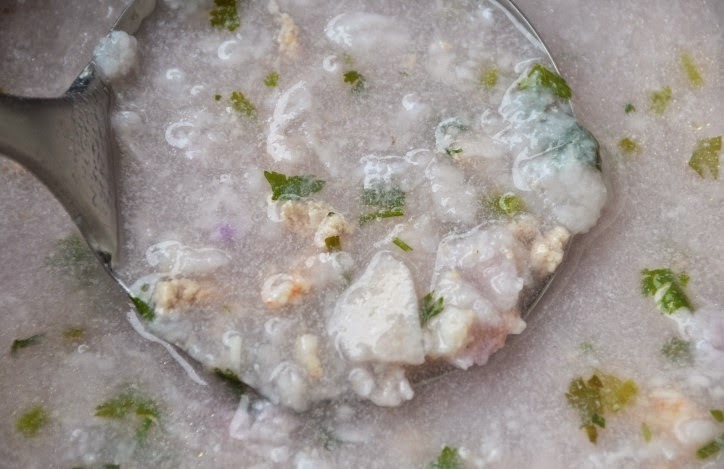 *After you have added some salty ingredients such as salt, fish sauce, and chicken powder, keep tasting your soup until you have added enough of these ingredients according to your own preference. I am staying with relatives who have similar taste as me--they prefer a mild salty flavor in their food.